Students are invited to meet in the Augsburg Room to have dinner hosted by Campus Ministry followed by Holy Communion. At its October meeting The Higher Learning Commission approved Augsburg College to offer the Doctor of Nursing Practice degree. Approved by the Augsburg Board of Regents last January, this approval is the culminating work of the Department of Nursing over the past two years. 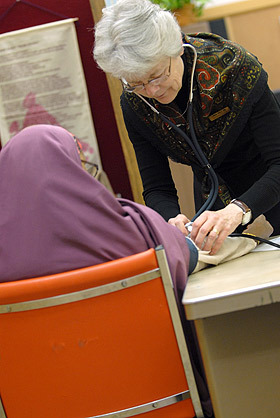 Augsburgâ€™s DNP program will focus on Transcultural Nursing in a World of Communities. Graduates of program will be eligible to apply for specialty certification in advanced transcultural nursing through the Transcultural Nursing Certification Commission (TCNCC) and for advanced certification in Community Health Nursing through the American Nurses Credentialing Center (ANCC). The Doctor of Nursing Practice at Augsburg will provide a venue for the development of nursing students prepared to enter generalist and advanced transcultural nursing practice in the 21st century that is consistent with the College's mission. The DNP program goals are to provide a sound scholarly foundation for nursing leadership in advanced transcultural nursing practice across care settings and among care systems; synthesize, critique, and apply nursing research and theory in advanced practice nursing and leadership roles to decrease health inequities within population groups and communities locally and globally; and to create and sustain a teaching-learning environment that promotes open scholarly exchange, personal growth, lifelong learning, leadership, and visionary vocational pursuit of professional service in the world. Congratulations to Dr. Cheryl Leuning and the faculty and staff of the Department of Nursing on this success and for their diligent work on this proposal and also for their dedication to the practice of nursing as Augsburg prepares the next generation of leaders in the nursing profession.